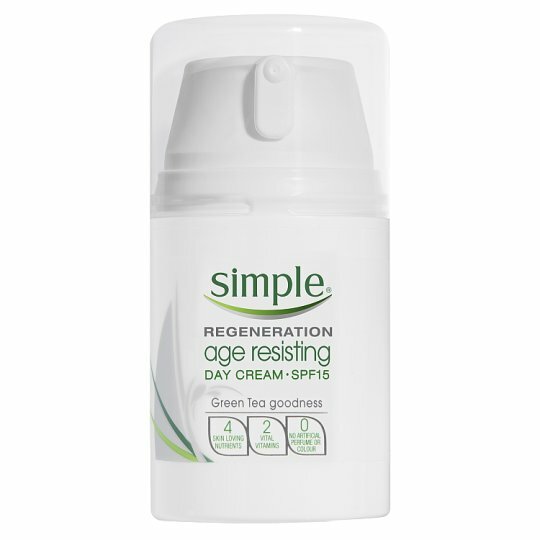 Help to defend your skin against the early signs of ageing with our Simple Regeneration Age Resisting Day Cream SPF15! When your skin is happy and feeling youthful, it can give your beauty routine a boost. Our Age Resisting Day Cream features a special blend of ingredients, containing Pro-Vitamin B5, Vitamin E, Mushroom Extract, Oat-Beta Glucan and Green Tea Extract, which helps to moisturise, soften and tone the skin and helps fight the signs of premature ageing. It also contains SPF15, making it ideal to use as part of your daily sun protection regime; skincare doesn't have to be complicated, and as it helps to protect and replenish skin this hardworking Simple essential plays an important role in our morning routine. Our Regeneration range is ideal if you feel your skin needs extra protection and replenishment to refine skin tone and help fight the signs of premature ageing, making our Age Resisting Day Cream a great addition to your anti ageing regime. After cleansing your skin, just smooth the cream into your face and neck using gentle upwards and outwards movements; one of our favourite tips for youthful looking skin is to take care not to pull or drag your skin downwards whilst applying your beauty products. Like all of our products, the Age Resisting Day Cream is perfect even for sensitive skin, containing no artificial perfumes or colours and no harsh chemicals that can upset your skin.